The 7th Annual ATC Conference is just around the corner and from the looks of the agenda it will be as fantastic as the previous ones. 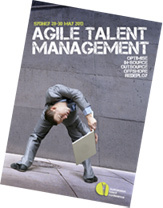 This year’s theme is around agile talent management and will be looking at the different ways you can structure your talent management function. As always the speaker line up is top quality and once again including several international representatives, including the likes of Gerry Crispin and Kevin Wheeler. Not to be out done by the international speakers there are local practitioners and consultants to help provide the Australian perspective; Davin D’Silva, Kimberley Hubble, and Jared Woods to mention a few. The agenda has a few very interesting sessions that I hope to attend. Jenny Hoysted and Tony Wallace are running a session about agile workforce planning which given many organisations struggle with regular workforce planning going agile with it would prove to be difficult. Also Richard Lishewski, Global Talent Acquisition Director, Nike session on the different options to deliver talent to your organisation will provide a bit of a global context to things. There are several session around social recruitment, no surprise there, even a “social media bootcamp” for those yet to jump on board. Several sessions are looking at how to balance your workforce in an era of outsorcing, offshoring, contigency and redundancies. While not speaking this year I am certainly planning to attend to catch up on what is going on. UPDATE: Since publishing this post I have been asked to assist in running one of the pre-conference workshops, Building a Winning Social Recruitment Business Case with Jared Woods. Posted on March 20, 2013 by Michael SpechtPosted in RecruitmentTagged ATC. A few months ago I started assessing what I would be doing come the end of March after this very long project was over. I blogged a few times about the process of trying to decide where I was going and what I was doing, I even applied for a few jobs. Well it is now time to make it official, from April 2nd 2013 I will be joining Navigo. There is a fair bit more to this story than I am off to join some organisation. Firstly very soon after my first post about starting to look for new challenges, Peter Forbes the owner of Navigo, reached out and asked if we could catch up. We caught up for a coffee in Hawthorn and discussed the state of the Australian marketplace, some of the things I have been trying to do with Inspecht and more importantly where he had been going with the Australia HR Technology Report. Navigo had released 2 reports purely focused on HR Technology in Australia, something brand new and really needed. We both knew that the marketplace wanted information about vendors and trends but Peter could now back this up with solid research. I had experienced the same while building Inspecht and what Navigo now had, which I did not at Inspecht, was this research. During 2012 Peter decided that he wanted to build out a new business line under the Navigo brand focusing purely on Research and Advisory. As part of this he went to market to try and recruit a Research and Advisory Analyst, with very limited luck. However when I blogged about looking for new work he felt I might be suited to the business, so he reached out. Over the next couple of months we met a few times discussing what the role might look like. I took Peter through some of my thoughts about what I was looking for in a role. At the same time he took me through the way the Navigo ran it’s business, from the heavy use of Confluence, fully integrated into their Sugar CRM environment to their process focused style of operations. As the relationship grew so did my comfort level of joining another organisation to continue the type of work I had started in 2009/2010 with Inspecht. So a couple of weeks ago I accepted the role as Senior Advisory at Navigo Research. Basically I will be building on the fabulous foundation of work already done on the HR Tech Report to write reports, white papers, and other research. In addition I will be building processes and practices to help organisations undertake technology reviews and complete the systems selection process. I plan to also work with both buyers and sellers of HR Technology in Australia to understand both the existing marketplace and the trends. (Vendors be ready for me to contact you.) With the best part of the role being to blog, write, and network with everyone and anyone in the HR Technology space in Australia. The Inspecht site has been closed and now re-directs here. There will be a new domain http://navigoresearch.com.au that will be launched before the end of April to be Navigo Research’s new home. We will be migrating all of the content from HR Tech Report to the new brand ( I say we but it’s really Jules the Navigo Marketing Manager who will do this part). From April 2nd you will also see me start to blog over at Navigo Research, this site will continue for personal blogging and the occasional rant. Something else I want to address; products and independence. While Navigo resells some products that is under their solutions business line which is separate from the research. I will be working very hard to ensure that complete independence is kept and all vendors get an equal showing a view strongly held by Peter as well. If someone ever feels that is not happening please contact me as it will be my personal reputation on the line if that does not happen.